LOCOG is committed to the use of public transport, with a target of one million extra walking and cycling journeys in London during the Games. The organizers have employed a sustainability assessment guide developed in part by UNEP. UNEP has been cooperating with the International Olympic Committee since the mid-1990s, helping to green the Games in Athens in 2004, Torino 2006, Beijing in 2008 and Vancouver in 2010. UNEP has provided a set of recommendations to the Organizing Committee of the Sochi 2014 Olympic Games in Russia to provide guidance on the integration of environmental considerations in the preparation and staging of the Winter Games. Rio de Janeiro has invited UNEP to assist in its preparations for the 2016 Summer Games. Some of the measures LOCOG has taken to make the London Olympics sustainable include the creation of the Olympic Park on once-contaminated industrial land in east London’s Lea Valley, the recycling of over 98 percent of waste during construction and the commitment to do the same in the demolition phase. Steiner listed LOCOG’s accomplishments on a walk through Olympic Park. “London’s clean-up of an old industrial site; the restoration of flows and habitat on the River Lea; the greening of supply chains; the low energy linked with the design and construction of the stadium, including utilizing old gas pipes for the facility’s Olympic ring; and the use of temporary structures to reduce emissions are among the actions that can assist in inspiring the organizers of the Rio 2016 games and beyond,” he said. This is the first time that a host city has committed to measure its carbon footprint over the entire term of the Olympic Games from construction to the finish line. “We are delighted to have set new standards in sustainable development, and to showcase the expertise and ingenuity of British companies in delivering a green Olympics so warmly welcomed by Mr. Steiner,” she said. One of the “secret jewels of the London 2012 Games,” said Spelman, is the One Planet Centre in the Olympic Athletes’ Village. Here the athletes can find out how the Olympic site was built using sustainable techniques. The interactive One Planet hub is filled with events and competitions such as swapping of pins, sharing of stories and use of social media that the athletes can use to find out more about protecting the environment. Spelman says the One Planet Centre encourages the athletes to use their role-model leadership to inform their fans about how everyone can take positive steps to help build a cleaner, healthier, and more sustainable future. The One Planet Centre is the result of collaboration between LOCOG, the UK government, charity and business. Developed by London 2012 in partnership with the Department of Environment, Food and Rural Affairs, the project is supported by Coca Cola and managed by the charity group BioRegional. British Olympian Ben Hunt-Davis said the special energy created inside the Athletes Village would be a powerful force to help drive change. Hunt-Davis won a gold medal in coxed eights at the 2000 Summer Olympics in Sydney as a member of the only British rowing team to have won this event since 1912. In addition to the One Planet Centre there is a photo competition and a number of Sustainability Circles designed by the Royal College of Art that tell stories of living sustainably and create a treasure hunt competition for athletes. 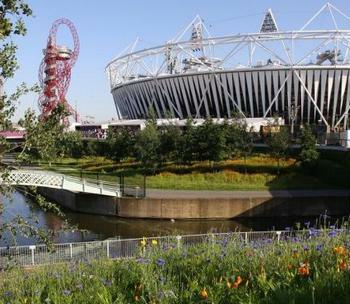 Athletes who want to find out more about the transformation of the Olympic Park, can take a walk through the park led by someone from the London 2012 team. In reclaiming the industrial area for Olympic Park, 98 percent of material from the demolition work was reused or recycled – exceeding a target of 90 percent. Temporary structures that can be dismantled and re-used after the Games are in place throughout the site, in particular, the Basketball arena, one of the biggest temporary venues ever built for an Olympic Games. 4,000 color-coded recycling bins and composting bins are placed through venues and Olympic Park, in an effort to achieve 70 percent re-use, recycling or composting during the Games. The unique design of the Olympic Stadium enabled it to be created with just 10,000 tonnes of steel – the lightest ever. The Velodrome was built with 100 percent sustainably sourced timber, and features unique meshing that holds roof in place with a third less steel. The 88 ‘light pipes’ in the Copper Box let natural light into the venue, achieving annual energy savings of up to 40 percent. At least 64 percent of all construction materials were transported to the Olympic site by rail or water, reducing the project’s carbon footprint. Centralized procurement, early supply chain integration and extensive trials and testing of various sustainable concrete mixes were key to reducing the overall environmental impact of concrete on the site. LOCOG is providing 14 million sustainably sourced meals during the Games, showcasing the best of British food. The meals are Red Tractor Farm Assured to production standards developed by experts on safety, hygiene, animal welfare and the environment; the fish is certified by the Marine Stewardship Council and the produce is certified Fairtrade. Carving out a new ecology of wildlife, plants and woodlands, the 250 acres of parkland is the biggest urban park to be built in Europe for 150 years with 45 hectares of new wildlife habitat. The park has been designed to mitigate the effects of climate change and increased rainfall by acting as a sponge to help manage water flow to the Thames River. More than 4,000 trees, 300,000 wetland plants and over eight kilometres of waterway for local residents and visitors to enjoy. There are more than 650 bird and bat boxes installed across the Olympic Park. Volunteers of all ages donated over thousands of hours of their time to clean up the Thames River and London’s other waterways. They removed over 950 black sacks of litter and large expanses of the damaging invasive weed Himalayan Balsam. Volunteers planted 12 wildflower meadows and 80 trees along river and canal banks in an effort to ensure the spaces that surround and intersect the Olympic Host Boroughs are clean, accessible and ecologically improved.